Michael Freeman may have some splaining to do!!! Hey People of Praise, below is a comment copied from someone responding to The Church Lady Blog’s post on Michael Freeman. Read This, All I can say is WOW!!! I have several comments. First, if you read the court documents you will see that none of the accusations are true. Pastor Joel never lost a house, he did not mismanage money and these rumors were put out by these employees and their lawyer to try and discredit him. Michael and Dee Dee Freeman spent time with Apostle, showered her with expensive gifts and became the power attorney for Apostle and the personal representative for her will and trust. Freeman introduced her to the lawyers who prepared her will, and Isaac Marks the one who prepared numerous documents, shut down the school and is representing the unelected board against the congregation, and against Pastor Joel and Chairman Meadows, and is representing Freeman in the will that Pastor Joel has contested. Pastor Joel had always had her power of attorney and was her personal representative and was not aware that it had been changed. This new complex will was written in Nov. 09 the same month that she went into the hospital and stayed for 3 months then was placed in a nursing home for 6 weeks. If Apostle was in her full mind and signing documents why did Michael Freeman exercise a medical directive and direct her care. A medical directive allows someone to make decisions for you when you are unable to make decisions for yourself. Someone is not telling the truth. If she was competent then they should not have exercised the medical directive. If she was not competent then the board should not have had her signing documents. The church is in the Washington metro area. He put her in a community hospital in Baltimore under his wife’s maiden name Wooton. His niece is a doctor on staff at the hospital (Denise Killen’s deposition). He later moved her to a nursing home also in Baltimore under this alias. He never told Pastor Joel that his mother was hospitalized, had several major surgeries and was in the ICU for 5 weeks.Stu Killen the husband of a rogue board member (church secretary) told several members that his wife and the board had meetings with Michael Freeman to sell the church to him because ” they are a dynamic couple and need a larger church.” Michael Freeman told his church during a television message that after Apostle died he got a call telling him that he had been named as a trustee over jericho in PG county. Just last week on his televised message he said that the Lord had given them the largest “ministry, church, santuary on the east coast.” Jericho is a non profit Apostle did not own it. She did not mention the church in her will. 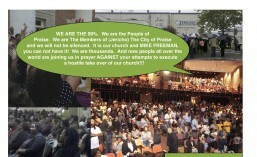 The only way for Mike freeman to get the church is for the trustees to sell/give it to him. They hold the deed to the church. They are listed in the will that Freeman oversees. Mike Freeman came out of the court house on Monday after the court case that Pastor Joel won against the board. The police officers said that they were directed by Mike Freeman not to let Pastor Joel take anything out of his office. Pastor Joel made a offer to buy his mother’s house at market value and Michael Freeman the executor of the estate would not sell his mother’s house to him. My heart is saddened to know that men of God can be so evil…how dare none of them notify Apostle’s family? I couldn’t imagine all of the events taking place with moms and her immediate family not having a clue. It’s all a evil scandal for money and property but what about people’s life? Were they not thinking about her family and people that loved her? Again my heart aches to know that mom’s was mistreated and surrounded by individuals that weren’t her family in her last days. Advice: read all depositions from May 2011 they are unbelievable, evil, and oh my gosh..it’s like a Lifetime movie script but God. Everyone testifying sounded false and borderline intelligence functioning. How do you join a board something SO major and have no idea of the history, the meetings, the bylaws…they shouldve known something was up esp if they knew Apostle as they claim: CJ, DW, and Boswell-then they discredit Joel like he was never a part of the church..omg it’s unbelievable- READ ALL DEPOSITIONS YOU’LL GET A BETTER UNDERSTANDING. As Joel stated last night the church is the people not the facility…it’s going to be interesting to see who will be in attendance at Jericho with the Pastor preaching elsewhere….shame on the illegal board of trustees…you all should be ashamed of yourself. I love Joel (as a child that has lost her mom) and commend him bc I don’t know if I would be able to forgive and grief properly knowing all that is coming to light. Peebles family you all will cont to be in my prayers. See you tomorrow at Metro Points for 10am service. Mr. Freeman you should be ashamed of yourself- God doesn’t like ugly…and don’t become a false prophet stating God said this and that (pertaining to Jericho) when you already know what it is bc you’re involved!! Ever since I first heard of Mike Freeman, there has always been controversy surrounding him!!!! It does not suprise me that he is in the middle of this terrible situation. The thing about Mr. Freeman is that he was a good student of Pastor’s. He followed her directions and imitation is the greatest form of flattery. He spet time with her and made her feellike family. He was not parasitin off her but stood on his own two feet. He befriended her and she befriended him. Henever acted like she irratated him. So from my perspective you live and you learn. It is OK to make a mistake and let your guard down. Don’t take anything for granted and move on. There is plenty of land in PG to build a mega-building for the church if you want. The church is the people not the building. Jericho turned into Jerishow. Don’t loose faith gain more. From the first time I saw him on tv, I knew through the spirit of ‘infinite intelligence’ something was not right about Michael Freeman. I turn him off or put him on mute in the morning while fixing coffee and waiting from one of my other TRUE PEOPLE OF GOD to come on. I AM NOT SHOCKED IN THE LEAST! I AM GLAD THIS HAPPENED SO PEOPLE CAN SEE HIM FOR THE FALSE PROPHET AND HYPOCRITE HE IS! Seriously, why would want to build a ministry by “stealing” properties where other ministries worshipped? That’s holy? We shouldn’t harm one another for God to bless us. Evil evil evil……but how comes he didn’t know where is mother was for all hat time. Doesn’t he go to the same church or keep in touch?! in this world of sin we live in… God will prevail. i dont know nor will anyone really ever know what happened.. what truths are and who is right in this situation…. but i know one thing My God is real. the devil is real…the devil is here to set sister against sister… brother against brother… the church if divided will fall… and thats just what Satan wants. Give God the glory and praise our Lord and Savior Jesus who died for each of us. for one day each of us will stand before God and give account.